Much of the attention paid to the national opioid crisis in recent years has focused on the national toll of the crisis, such as the more than 44,000 opioid overdose deaths reported nationally in 2017. However, the dynamics of the crisis vary widely across states, both in the prevalence of opioid overdose deaths and the types of opioids associated with those deaths. 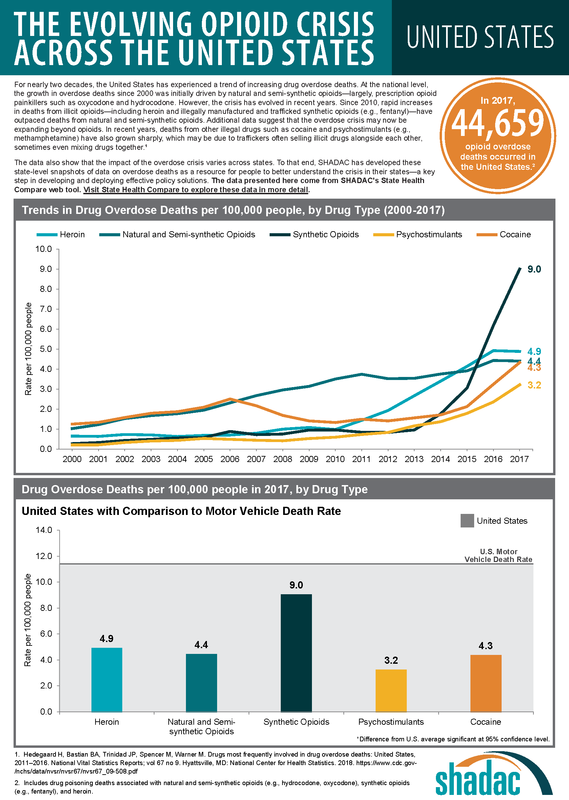 To make state-specific information on opioid overdose deaths more easily accessible, SHADAC has used estimates from our State Health Compare online data tool to create a set of two-page infographics for all 50 states and the District of Columbia that include new data on drug overdose deaths for 2017. At the national level, data on opioid overdose deaths show multiple, evolving phases of the overdose epidemic. From 2000 to approximately 2011, the growth in opioid overdose deaths was driven primarily by natural and semi-synthetic opioids (i.e., prescription opioid painkillers); but that death rate has since largely plateaued. Beginning around 2011, deaths from heroin began to increase more rapidly and were responsible for the highest overdose death rates in 2015. Since around 2013, however, deaths from synthetic opioids, such as fentanyl, have grown precipitously, and in 2017 the overdose death rate from synthetic opioids was nearly double the rate for all other drug types. Around the same time that death rates from heroin and synthetic opioids began to increase, deaths from cocaine and psychostimulants also began to increase. Evidence suggests that this relationship is driven, at least in part, by an increase in deaths that involve multiple drugs: Since 2011, when deaths from heroin began to rise, death rates from cocaine have nearly tripled, from 1.5 per 100,000 people to 4.3 per 100,000 people in 2017; and death rates from psychostimulants have more than quadrupled, from 0.7 per 100,000 people to 3.2 per 100,000 people in 2017. Although most states have experienced measurable increases in opioid overdose deaths since 2000, the scale of the crisis has varied widely across states. For example, West Virginia’s rate of deaths from synthetic opioids in 2017 was more than 30 times the rate of Nebraska and Texas (37.4 deaths versus 1.3 deaths per 100,000 people). The types of opioids most commonly associated with overdoses also vary across states. For instance, Utah had the second-highest rate of deaths from natural and semi-synthetic opioids in 2017, at 10.0 deaths per 100,000 people; however, contrary to the U.S. trend, the state has experienced relatively little growth in deaths from synthetic opioids, and the state’s 2017 death rate from synthetic opioids (3.1 per 100,000 people), fell well below the U.S. rate of 9.0 per 100,000 people. The scale of overdose deaths from non-opioid illicit drugs also varies widely across states. For example, the 2017 overdose death rate from cocaine in the District of Columbia (17.6 deaths per 100,000 people) was 22 times the rate of Arkansas and Kansas (0.8 deaths per 100,000 people). Similarly, the 2017 overdose death rate from psychostimulants in West Virginia (13.6 deaths per 100,000 people) was more than 15 times the rate of 0.9 deaths per 100,000 people in New Jersey. Death rates from heroin and synthetic opioids are generally higher east of the Mississippi River, particularly among states in the Northeast, the Appalachian region, and the industrial Midwest. Higher death rates from natural and semi-synthetic opioids are more geographically dispersed than those from heroin and synthetic opioids. 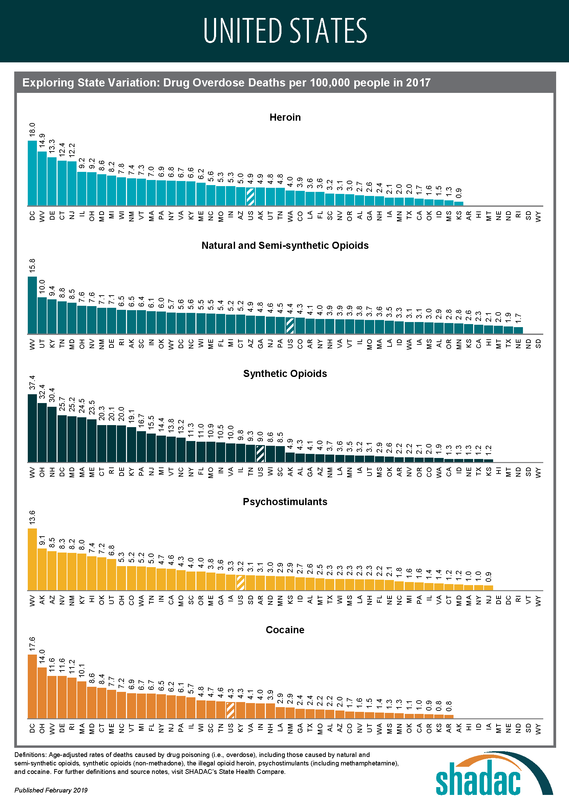 While some states in the eastern U.S. have particularly high rates of deaths from natural and semi-synthetic opioids (e.g., Kentucky, Ohio, and West Virginia), there are other states in the western U.S. that also have similarly high death rates from these drugs (e.g., Utah, New Mexico, and Nevada). An examination of cocaine death rates reveals a pattern similar to that of death rates from heroin and synthetic opioids, with states east of the Mississippi River exhibiting higher rates of cocaine overdose deaths. Death rate patterns from psychostimulants appear to be almost the opposite of those for heroin and synthetic opioids, with relatively low death rates in the Northeast and particularly high rates of deaths in the western U.S. and the Southeast. Only a group of three state—Kentucky, Ohio, and West Virginia—shows strong overlaps between psychostimulant and heroin and synthetic opioid deaths. Access the state-level infographics on drug overdose deaths. Explore the data on drug overdose deaths on State Health Compare. This number includes deaths from natural and semi-synthetic opioids (e.g., prescription opioid painkillers), heroin and synthetic opioids (e.g., fentanyl), but it excludes some opioids with relatively fewer deaths, such as methadone.